Blue River Publishing is launching their newest book, Is There a God? Is He Real? 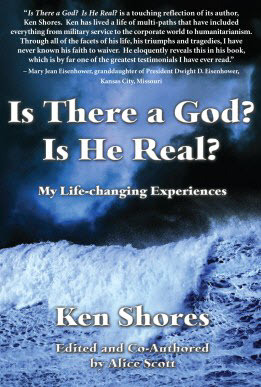 My Life-changing Experiences by Ken Shores (edited and co-authored by CIPA Associate Member Alice Scott). Release date is scheduled for October 30, 2012, available by emailing Alice Scott here or 719-260-9035. Mention CIPA for a 20% discount. The book is endorsed by Mary Eisenhower, granddaughter of the 34th President of the United States, Dwight D. Eisenhower: “(It) is by far one of the greatest testimonials I have ever read.” Other readers have said they couldn’t put it down. Associate Member, Nick Zelinger of NZ Graphics, did a commendable job on the cover. Printed by Snowfall Press.